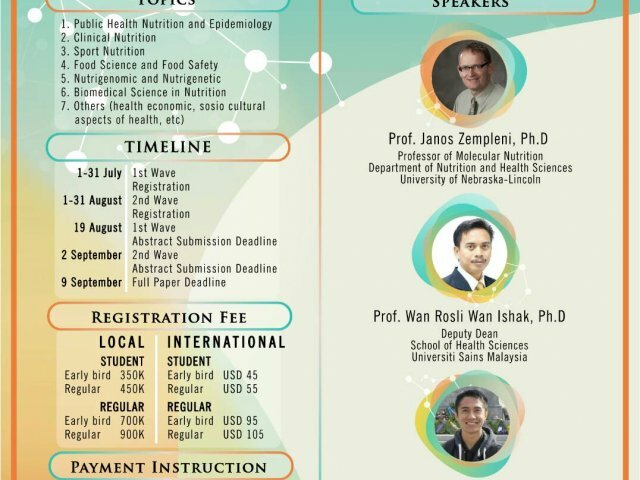 On behalf of Department of Nutrition and Health, Faculty of Medicine, Public Health, and Nursing, Universitas Gadjah Mada, Indonesia, we are delighted to welcome you to the Second International Nutrition and Health Symposium. This year, the meeting will be held on November 3rd 2018 in Jogja Plaza Hotel, Yogyakarta, Indonesia. Bringing the theme of “Nutrition In Degenerative Disease”, we invite researchers, health professionals, industries, government, and non-governmental organizations to come and share their latest findings in nutrition or related fields. Due to the end of 1st wave registration on July 31st 2018, we open the second wave registration just for you! If you have any inquiry, please do not hesitate to contact us at ugm.inhesion@gmail.com. You will be most appreciated if you are willing to circulate this email to your colleagues. We are looking forward to meet you in Yogyakarta.